THE IMPERIAL PLATE OF PERSIA by SPODE: Plates produced in 1971 in a limited edition of 10,000. The plate is Spode fine bone china and measures approximately 10 1/2 inches in diameter. The decoration is in 22 carat gold and rich enamels and the plate marks the 2500th anniversary of the founding of the Persian Empire. On the back of the plate is an inscription in Farsi and English - "The Imperial Plate of Persia with the approval of His Imperial Majesty Mohammad Reza Pahlavi Aryamehr, Shahanshah of Iran. 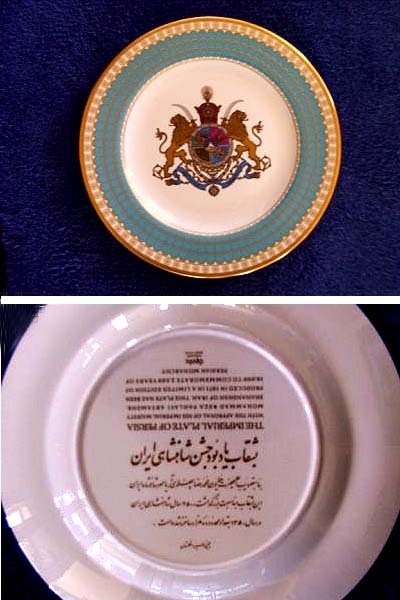 This plate has been produced in 1971 in a limited edition of 10,000 to commemorate 2,500 years of Persian Monarchy."